Umpire Aleem Dar’s howler in dismissing Australian batsman Phil Hughes leg before yesterday in Mohali was a turning point in the third Test against India. With no DRS to deny Dar’s major mistake, Hughes was on his way, sawn off for 69. Had Hughes batted another 10 overs for 15-20 runs, India wouldn’t have had time to score the necessaries, and the Australians would have salvaged an honourable draw. Which after two floggings by eight wickets, and an innings and 135 runs, would have felt like a win. Why the ICC, cricket’s governing body, allows India to get away with denying use of the DRS is beyond comprehension. The ICC should legislate to make the DRS mandatory for all three formats in all countries. And if India holds out, tell them to get stuffed, and ban them from all formats until they comply. Then we wouldn’t have howlers like Dar yesterday. So to the fourth and final Test at Delhi starting on Friday. 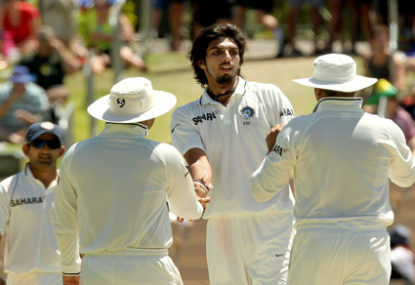 India has never won four Tests in a series in its history, and they have the ammo to fire again at the Australians. Mixed news from the baggy green camp with Shane Watson returning after his one-match suspension, the subsequent dummy spit, and the birth of his first child. But a big question mark over skipper Michael Clarke whose dickey back is again causing strife. He was clearly not fit enough to bat yesterday, and Friday isn’t far enough away. Given Clarke is out of Delhi, Watson assumes the captaincy. Then the selections become interesting. No reason to change David Warner and Ed Cowan at the top of the order, but I’d bat Watson at three, with Hughes at four, to split up three lefties in a row, and the higher Watson bats the better he plays. Retain keeper Brad Haddin at seven for two reasons – firstly he’s the better gloveman and better batsman than Matt Wade and secondly Watson will need all the help he can get to lead the side, and Haddin is an experienced first-class captain with NSW. He was in charge when Clarke left the field for treatment yesterday. Mitchell Starc is bowling a lot of rubbish, but he is a genuine batsman and deserves to be promoted up the order, as does James Pattinson. That leaves Peter Siddle at 10, and offie Nathan Lyon, the best of the spinners, at 11. The batting order if Clarke doesn’t play – Warner, Cowan, Watson, Hughes, Khawaja, Smith, Haddin, Starc, Pattinson, Siddle, and Lyon. If Clarke plays, and it’s a big questionable if, the skipper bats at five and Khawaja misses out. The rest remain as mentioned. The Australians want to leave India with some pride restored. It’s Australia’s last chance to stop the rot. They almost did in Mohali which was a big improvement. Because another loss in Delhi would be simply unacceptable.